Overview: Welcome back to the smashing adventures of the Hulk. Our misunderstood monster has moved into the 1970s, still hounded by the army but now facing new challenges from friends and foes alike. Hulk faces off against his familiar gamma-radiated foes in the Leader and the Abomination. But now he starts branching out to be threatened by the Rhino, the Absorbing Man, Maximus, and the Mole Man – all villains generally associated with other Marvel heroes. Speaking of which, the heroes themselves get matched up against the Hulk, as the Avengers and the Fantastic Four cross paths with the Hulk in an attempt to subdue him. Note the use of the word attempt, because no one stops the Hulk. This volume shows us a different side of the Hulk as well. He picks up a new sidekick in Jim Wilson, who does his best to help his new jade friend. We also meet Jarella, the princess of a sub-atomic world that is a mix of high-tech and sorcery. Jarella becomes the love of the Hulk’s life, although Bruce Banner still remains true to Betty Ross. What makes this Essential? : I really enjoyed this volume. Roy Thomas takes over as writer from Stan Lee, and moves the character away from being on the constant run from the army. Instead, we get more match-ups against foes who could test the Hulk’s strength, such as the Thing, Absorbing Man, the Rhino, and others. He is built up as the misunderstood monster who wants nothing more than to be left alone. We meet Jarella for the first time, and see the sensitive side of the Hulk, showing he has other emotions other than anger. This is a great volume to own if you are a fan of the Hulk. For the casual Marvel fan, it’s worth a read, but it may not be essential. Footnotes: Incredible Hulk #126 is also reprinted in Essential Defenders Vol. 1 and Essential Doctor Strange Vol. 2. Avengers #88 and Incredible Hulk #140 were also reprinted in Essential Avengers Vol. 4. Captain Marvel #20 and #21 are also reprinted in Essential Captain Marvel Vol. 1. If you like this volume, try: the 2008 Hulk series by Jeph Loeb and Ed McGuinness. Following the events of the World War Hulk storyline, the Incredible Hulk title was renamed to the Incredible Hercules and given to the Greek Avenger. The Hulk moved into a new adjective-less title and a new take was presented with the character. A mysterious Red Hulk was introduced, which led to months of speculation as to who that might be. McGuinness’ art is perfect for the Hulk and his supporting cast, and Loeb was having fun with the stories. This has been collected multiple ways, so it should be easy to find. This entry was posted in Hulk, Marvel Essentials and tagged Gil Kane, Harlan Ellison, Herb Trimpe, Hulk, Roy Thomas, Stan Lee. Bookmark the permalink. 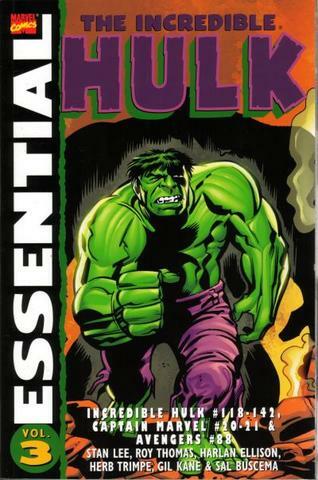 Pingback: Throwback Thursday – Essential Hulk Vol. 3 – WORST. COMIC. PODCAST. EVER!